I am not a fan of The Compact Disc. Sure, when it first came out I was as charmed as anyone by the lack of surface noise and the previously non-transferable bright end of the recording spectrum. I sold myself out to it exclusively — my first collection of stereo components did not include a turntable. But it did not take long for the honeymoon to end. Unlike its more commanding parent, The Long Playing Record, which demands to be either stored away or put on prominent display, there is something about the physical format of the CD that prompts itself toward clutter. There is no attractive way to display these little plastic boxes (or “jewel cases” as they've been erroneously, or ironically, named). And the leaflets they protect are a scant product. What additional material do they give the listener to ponder? A photograph or two of the band, lyrics in an aloof san serif font and the usual “thank you”s — God, Gibson & Grandma. If that. Sometimes all the customer gets is a track listing. When That Corporate Digital Behemoth finally announced it had figured out a way to provide listeners with the sound and performers with a little chump change, I actually rejoiced. Perhaps now I could finally remove all that — here’s the word again — clutter from the living room and refurbish the place with the antique and ornate forms of old: books and albums. Wife permitting, of course. But there are exceptions — three of them, in fact. That's right: three CDs I would recommend solely for the packaging. #3: I, Flathead, Deluxe Edition by Ry Cooder (A). The “shocking full-length false memoire” (sic) enclosed is beautifully formatted, if less-than-compelling, reading. In this case, the substance of it exists as a loving vanity stand for the real material: one of the finest collections of songs to come out in the last five years. #2: Lonely Avenue, Deluxe Edition by Ben Folds & Nick Hornby, with four stories by Hornby and photographs by Joel Meyerowitz (A). Anyone who likes Hornby’s writing can't help but be pleased with this purchase. Four stories, lyrics, liner notes and an e-mail exchange between the collaborators — for this content alone, it is money well spent. As for the music . . . more later. #1: 10,000 Days by Tool (A). I’m pleased to see that this CD still seems to be required stock in places that still sell CDs. If you don’t yet have a copy of this, hike out to your music store as soon as possible. You should spot this pretty quickly: it is the largest and ugliest looking thing on the rack. It looks like a fat plastic wallet festooned with a pair of cheap magnifying glasses. In fact, those lenses are required for viewing the contents of the package — photos of the band members posing as alchemists, esoteric illustrations by Alex Grey — which are laid out in stereoscopic 3-D splendor. Anyone with the slightest yen for metal should dig the music, too, for its competent use of contrapuntal rhythms and lack of cookie-monster vocals. And for its sincere use of esoterica (also on display on their website). This is the kind of package that gets a guy like Erik Davis very excited, which, once upon a time, was the kind of thing that made rock ‘n’ roll a garish circus you could not take your eyes off of. Alright: so we have a single Sony product nudging out two by the vastly more ambitious Nonesuch Records. 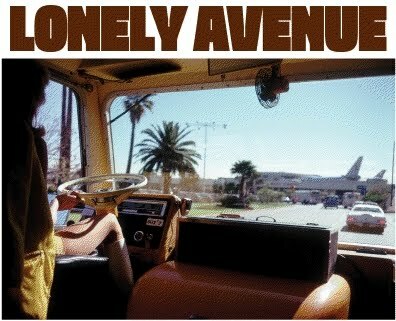 Onward, then, to Lonely Avenue and its music. First spin: it struck me quite forcefully, as I listened to Folds stretch a musical phrase to make room for Hornby’s syllables, just how suggestive successful pop music has to be, of necessity. And I’m not just speaking of the sexually suggestive, although a little of that goes a very long way. Successful pop music manages to evoke all manner of yearning and regret, shame and joy. The more implicit the sentiment, the more powerful the song. Unfortunately for the cognizant among us, suggestiveness can be accomplished by bluntly stupid lyrics attached to a simply constructed hook. This was made obvious to me when Steve Almond splenetically rendered the unintentional hilarity in the lyrics of Toto’s “Africa” as I read before bed. Next morning, of course, I was passionately singing the offending song as I showered. As Folds sang Hornby’s incisive lyrics, I found myself chafing against the explicit and yearning for the implicit. Today’s “alternative” acts might be overly smitten with the nonsensical, but any performer who allows the listener to fill in the gaps — no matter how abysmal — is paying the patron the highest compliment. The first time around with this collection, I too frequently felt spoken to. Subsequent plays, while not as off-putting, still weren’t winning me over. Folds’ music was sweeping, snappy, polished: was I to lay the fault solely at Hornby’s feet? I ruminated over the lyrics. The only song I really dislike is “Levi Johnston’s Blues” for subject matter that already lacks nuance, and which grates on me nearly as much as Johnston’s on-again/off-again mother-in-law does. As for the rest, the best of them approach the comic defeatism of Steely Dan’s “What A Shame About Me” (“Your Dogs” “Password” “Doc Pomus”) minus the reliably ironic back-beat, or unfold with Elvis Costello-like moribundity (“A Picture Window” “Claire’s Ninth”) minus the reliably personal stake that Costello has in all his songs (sorry, Ben, but that’s your department). Ah, but don’t mind me. Odds are I’m still nursing a grudge for the less-than-glowing review Hornby gave Steely Dan ten years ago. “Steely Dan needs to loosen up a little,” wrote Hornby: “pop music is still pop music, no matter how smart you are.” Any doctor can prescribe, of course. And there is a moment on Lonely Avenue when the “loosen up” is attended to: we hear Ben Folds delivering “Belinda” with all the balls-out ardor of a younger Little Richard. It’s a hint of the sort of playing around that went on behind the scenes as he and Hornby tried to reconnoiter their way into the project, and it’s catchy as hell. Unfortunately, it’s a last-minute throw-on: the final 11 seconds of the album’s final song. Oh well. Buy it for the package. Maybe you'll love the music, maybe you won't. Either way, you won’t be sorry. Post-script: Metacritic tabulates a metascore of 63 for Lonely Avenue, here. This is a message of a half century of sexual wisdom. And it is oddly comforting and mesmerizing. He nearly whispers, “Hold on to your dreams and don't be confused by what everybody else tells you you ought to be doing.” There is a cuckooing of exotic birds outside, and you can almost hear Jiminy Cricket piping up: If your heart is in your dream, no request is too extreme. "The Road To Boobville" by Adam Sachs, GQ, December 1999. My thoughts on Hef are here. Ebert, on the other hand, is a little more smitten. In 1976 the media culture, newly experimenting with public talking cures, helped foster a more interesting kind of self-pity (farewell to Nixon's antique and unconvincing “I'm not a crook”). In 1976 we had Betty Ford, the outgoing First Lady who later would confess to substance abuse. And we had a new president who would confess to lust — at a time when this was unprecedented and not yet required by the attorney general's office. Indeed, Jimmy Carter's 1976 grassroots presidential campaign brought us something new, and not just double-digit inflation and soaring interest rates. A president so deeply well intentioned — a president in denim — was something this country had never seen before. For Jimmy Carter, the denim may have been a statement, but it wasn't yet a cynical costume. For that we needed Reagan. Then Bush, then Lamar Alexander. For Bill Clinton, apparently, clothing itself was a cynical costume. Lorrie Moore, on her favorite year, for GQ, December 1999. It was Sunday night. The girls were organizing their knapsacks for the school-week ahead, their mother and I were nursing the dregs of the evening's martini. We were all in the kitchen and music was playing through the speakers. The family has an assortment of “music file players” and we take turns plugging them into the kitchen tunes contraption. Tonight was my turn. The music seemed to catch my wife off-guard, and what she thought might be a singular lapse on my part was quickly proving to be corporate. Nostalgia. In high school I had a buddy who took over his mother's Plymouth Duster. The car came with an eight-track cassette deck, and three eight-track cassettes. One of those was a gospel quartet, which even we could not stomach. The other two we didn't mind, and played to death. Or so I thought at the time. I explained this to my perplexed wife. Hm. In hindsight the other performer might have been a touch easier to explain. John Denver, anyone? I had trouble coming up with a title for this post, which is really little more than an excuse to link to Jeff Baker's erudite review of Acid Christ: Ken Kesey, LSD & The Politics of Ecstasy by Mark Christensen. I link because the conversation turned (briefly) to those lovable hippies and their scribes: Kesey, Vonnegut, Heller, Brautigan, Robbins. Hm. All guys, and most of 'em too old to actually be hippies. Who am I missing -- besides Erica Jong? Sure, it's a conveniently-sized, oh-so-tidy spot for me to store all my music, from the quirky to the glorious to the gloriously quirky. Sure, I've listened to everything on it at least once. But as the song count on my iPod approaches the 5,000 mark, I have to wonder if I'm not the musical embodiment of The Rich Fool. It looks like Terry Teachout is in a frame of mind somewhat similar to my own. Lee Marvin is alarmingly at home in The Dirty Dozen. He almost makes its cynical point of view look respectable, not by finding it profound but simply by enjoying himself in a way that amounts to an endorsement. Facing a crop of newbies all eager to go over big — John Cassavetes and Donald Sutherland, for two — he looks as amused by the idea that they can compete with his serene underplaying as an elephant surrounded by chimps. They're all playing murderers and head cases, but to him it's a given that he's more formidably frightening, because he doesn't need to be psychotic to act this way — just to trust his superior acquaintance with how the world works. He sells the movie by finding nothing in it surprising. "The Big One" by Tom Carson, GQ, April 2005. With fab illo by Tavis Coburn. As our family prepared for a week of vacation in Maine, I deliberated over which novel to bring along. I had hoped to luck into used copies from Maine's literary habitués (particularly Richard Russo and Stephen King) but, alas, geography-specific fiction was not in my cards. Since the plan was to drive through northern New York, which I considered John Gardner Country (even if we would be missing Batavia by a wide sweep), I meditated on his titles for a few minutes before deciding against it. Eventually I settled on my old, previously attempted copy of Rick Moody's The Diviners. I haven't a clue what made me think this go-round would be any more successful than my previous attempts. Twice before I had returned the book to its spot on the shelf, always for the usual reason: what Moody had hoped would be challenging, I read as self-indulgent and distracting. But then we all know story-tellers who beguile their listeners with those very traits — the uncle who laughs hardest at his own joke — so maybe now was the moment for me to share in the laughter. Turns out it was. I thought the book was a hoot. I was in a satisfied state of mind when I finished, which stayed with me for the next few weeks. Given my yin-yang experience of the novel, I doubt I could motivate others to read it. The least persuasive aspect of the novel is its central premise: a malleable story about generations of water-dowsers that inspires everyone who hears about it to put their previous lives on hold so they can to get it into production. So much ink and air was expelled to give this concept life, but since none of it struck me as either funny or moving, it instead came off as lame. Still, the characters that got whipped into a froth over it were lovable mutts. I was glad I'd kept the book around. There are a few dozen other titles with similar potential, parked on dusty bookshelves in different corners of the house. I live in the hope I'll eventually experience a similar awakening unique to each. Odds are they already occupy space in Richard Brautigan's Bookstore (link). Getting back to Stephen King for a moment (who, I suspect, had some admiration for Brautigan): Sam Sacks really takes the boots to King, not just for the prose, but for the pose. I don't have a dog in this fight (so far as I know) — I loved this book when I was a kid, and thought these two provided worthy moments for kids and adults — but I have been struck by King's surliness toward critics and prize awarders, and even his own publishers and readers. Dude: you're richer than God, everyone who reads English has read at least one of your books, you have a wife who loves you and children who show up at Thanksgiving — content yourself, o mortal! The basement purge began in earnest this August. And one of my foremost realizations while purging was, there are very very few magazines worth holding on to past the end of the month. Not that I've had an easy time throwing them away. I've been slowly culling through the bales of print in the basement, and while 99% of what I'm looking at gets a quick flick into the Blue Box, there is still the occasional issue that returns to the (now roomier) shelf downstairs. Then there are others joining a growing pile next to the door, because they have one or two articles that still engage, or maybe even just a quote or two. I've decided that if it's just a quote I'm keen on, I should post it up here and give the bundle of paper the old heave-ho. If the article is on-line I will link to it; otherwise, the enjoyable quote just exists as it is, in all its virtual, context-free glory. For the first example, scroll down. Wayne Coyne of The Flaming Lips, from Have You Met The Lips? by Tom Junod, Esquire Magazine, March 2003. Over at First Things R.R. Reno wonders if a passion for theory doesn't run the risk of becoming idolatry. Hm — “Whisky Prajer: Man of Letters.” Kinda has a ring to it, I think! Neither of my trusty comfort food authors — George Pelecanos or James Lee Burke — seem to be reaching me this time around. There’s no point in me getting technical about the distance, since they’re doing pretty much what I’ve always paid them to do. 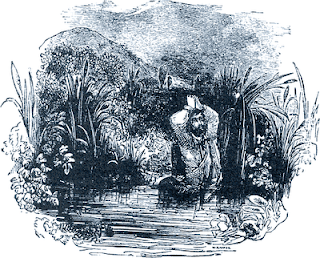 The problem lies with me: I’m momentarily mired in a wee slough of despond, in which the usual charmers have lost their powers to distract. There are a number of reasons for this. I left my job in June. It was, and remains, the right thing for me to do, and it freed me up wonderfully for the summer. But I haven’t yet found another to replace it, and I miss the contact with other people, especially now that the girls are back in school. Also, this month marks the second anniversary of my father-in-law’s death, and I think my wife and I miss him more this year than we did last. So it goes. Although there is a certain amount of activity a person should engage in to prevent grief from slipping into self-indulgence, the absence must be acknowledged. Attention must be paid. Even in this condition, however, it surprises me that Mordecai Richler’s social dyspepsia fails to move me. In preparation for Montreal I pulled Barney’s Version off the shelf, figuring I’d best give it one last read before Paul Giamatti’s mug permanently burned itself into my brain as the lovably difficult (to say the least) Barney Panofsky. I have to say, 45 is a much better age to read this book than 32 was. Even so, I’m taken aback to realize that nearly all the cultural/historical points of reference that Richler/Panofsky comment on with such acidity have pretty much passed their “best before” date. Richler seems to have sensed this eventuality, and wields these details with a canny awareness of their, and his narrator’s — and his own — mortality. Still, it makes my bittersweet read of the book more bitter than sweet. I can’t imagine a 25-year-old Canadian reader connecting with this book at all, never mind at the pleasantly superficial level I seemed to 13 years ago. Thankfully, music still hath charms. 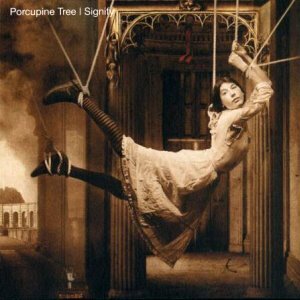 In a last-minute scramble to use up my monthly downloads at eMusic, I tripped across Signify by Porcupine Tree — and fell in love. PT’s rep seems to be “new prog.” I haven’t heard enough of what they’re up to lately to comment, but this artifact from 1996 is moody and ethereal (“atmospheric” to use the parlance), occasionally lyrical in a Flaming Lips sort of way. Sampling is judiciously resorted to: one or two evangelists are recruited for sound-bites that could, but needn’t, be heard ironically (although if one of these evangelists is, as I suspect, Benny Hinn, irony is better than he deserves). They struck me as a Life After God echo, which has a winning sincerity of sentiment for me. Signify plays like the last soundtrack to be broadcast before the Blade Runner world of indentured serfs and privileged enforcers finally took over. 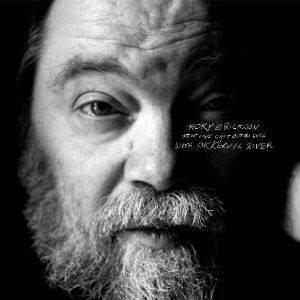 My most recent aural fixation is with True Love Cast Out All Evil by Roky Erickson, former front-man for the 13th Floor Elevators. When it was first released in April I took only vague note of it. Erickson’s reputation to date had been as one of rock ‘n’ roll’s most spectacular acid casualties, a la Syd Barrett and Brian Wilson — here’s the wiki. True Love Cast Out All Evil was hailed as a recovery/comeback for Erickson, a designation that, for me, has all the appeal of reheated left-overs. On one of my recent forays as Taxi-Driver To The Adolescents, I retrieved a copy of Mojo collecting dust on our coffee-table. I’d bought it some months earlier, but hadn’t yet leafed through it. I perused while waiting for the event to conclude, and found it to be exactly the sort of issue Mojo is occasionally brilliant at. Tom Waits “guest edits”, so that flavors much of what’s present. He interviews Hank III; Joe Henry interviews Harry Belafonte. And Bill Holdship gives a rave review for True Love Cast Out All Evil. Until I read Holdship, I hadn’t realized just how deep an abyss Erickson has emerged from. And while True Love is all about the gift of recovery, it has a sound that echoes back into that void. Okkervil River, who I never had much of an ear for, prove themselves to be Erickson’s ideal collaborators, conjuring a background that drifts from dreamy to jarring to triumphant. The album is very much a gospel tent extravaganza, with a bloody-heart-on-the-shirtsleeves sincerity that will either convert the listener or send him back out to the cold back alleys of Hell. Something like this will never appeal to everyone, but it certainly feels like it has found me, and not the reverse. Links: Barney's Version, Porcupine Tree, Roky Erickson, Okkervil River. And this guy writes quite the rave for True Love. Darwyn Cooke's original outing with Richard Stark's Parker was a lushly rendered, graphic tour-de-force. 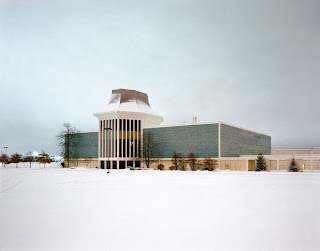 With his second go-round, the aesthetic more or less remains, but much of the energy is gone. Part of this is due, I think, to Cooke's strict faithfulness to Stark's work. There are Parker books where the action is very physical, and moves relentlessly forward, The Hunter being one such. But there are also Parker books where most of the action is in Parker's head, as he adjusts tactics to stay one step ahead of his mark. The Outfit (A) falls all-too-solidly into the latter category, which must have driven Cooke crazy. Midway through the adventure, Cooke resorts to several varieties of metatext, inserting a (vintage) men's magazine story to provide several pages of back-story, or ritzing out another caper in a Googie-graphic fashion that brought to my mind a very particular incarnation of the Wizard of Oz (source). Meta-text/narrative is a jarring strategy at the best of times, especially so in a work that is fighting stasis from the get-go. The book concludes with the promise that "Parker will return in 2012." Two things are noteworthy about this announcement: (1) unlike the last outing, it makes no mention of which book Cooke will adapt next (2) Cooke has given himself a deadline that could extend to two years. I think both are worthy strategies with material that is as tricky to adapt as Parker, and I look forward to the next adventure. Sorry: no illustrations with this post, because the stuff I'm wingeing about isn't the stuff on offer in teh interwebz. Thus far I'm the only one kvetching: this guy makes a strong case for the book. In his review, and other picture searches, all you get is Cooke's super-fab illos, which I've got nooooo beef with whatsoever. André Alexis responds to his responders (the noisiest of them, at least). I continue to find it all quite thought-provoking, obviously. I realize my own response misses Alexis' larger point (this country's capacity to critically engage with the culture of the published word has faded to the point of obsolescence). But I still think the issue of writer and audience is pertinent. Can any writer content herself with being heard by an audience of one, or, possibly, none? This is amusing. 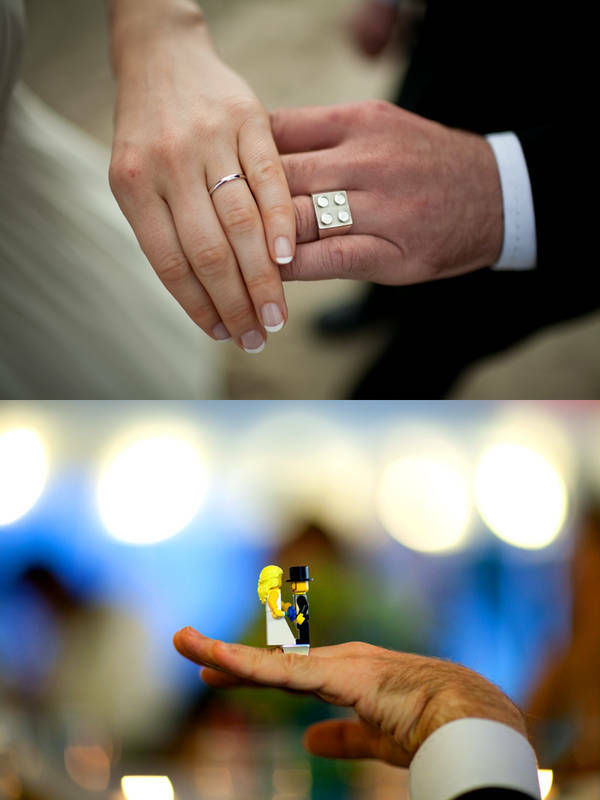 I can't help but notice the Lego "bride" is head-and-shoulders taller than her groom. Nothing wrong with that, of course, but I'm curious: are the mini-figs proportional to their human hosts? Also, what's with her ring? The single stud not good enough for her? If they ever need marriage counseling, I've got the bricks.